Hello all! 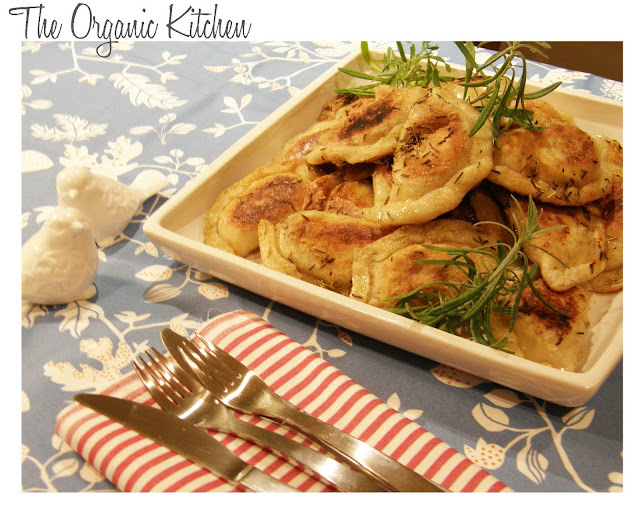 Welcome to PGD's first Organic Kitchen post! Jonathan and I have been wanting to do this for a while now, so I'm really happy to be finally delivering. What is the Organic Kitchen? Well, first a little history: Jonathan and I love to cook, well, he does in particular, and I love to partake! It's fair to say we both love food. One of the many ways we try to live green is to eat good food, grown by good people, using good farming practices. Our desire to share this experience with others is what has prompted the Organic Kitchen. In all truth, my husband Jonathan is the author of this column (I took the pictures) - he is witty and smart, I'm sure you'll enjoy reading his column, and hopefully feel inspired to try a few of his recipes! So, without any further hoopla, here is Jonathan, with the first installment of the Organic Kitchen (I know this is more lengthy than the usual PGD post, but bear with him - brevity is not his strong suit - you'll be glad you did. 'I have a passion for food. Making it, eating it and especially sharing it. I love to cook for people. It’s rarely well planned and always interesting – most of the time I can’t tell you what goes in a dish until I make it, and unless Céline writes it down I generally can’t tell you after either. I’m working on that so that I can share some of my favorites with you – but just a brief disclaimer: my recipes are more like rough guidelines (as are all recipes in my opinion) so adjust ingredients to suit your taste. My goal is to share with you my favorite recipes, most epic blunders, foody anecdotes and topics ranging from eco friendly cookware and cooking techniques to great wine discoveries to gastronomic chemistry lessons to the always popular ‘zen meat’ debate. There will not be discussion or recipes that involve tofu – I’m convinced it will cause prostate cancer (at least, that’s what I tell my wife)...ya ya Jonathan, we all know that tofu, while prepared properly is delicious, is not for you....and no, it doesn't cause prostate cancer, but I will give you that it isn't good to eat too much! So what do I know about cooking? You be the judge. Am I a Chef? Hell no. I’m not socially maladjusted enough for that, LOL, (*read Kitchen Confidential by Anthony Bourdain if you want some insight into the culinary underbelly). Actually, that was not a fair statement – I know many great Chefs and at least one of them isn’t socially devolved. So no, I am not a chef, though I have trained a few. I have been a restaurateur for the better part of my adult life, I have a genuine passion for food and I have cooked and experimented with food for as long as I can remember. I know what tastes good, what makes a good meal, how to have fun in the kitchen and how to love food that loves you back. Makes 24 – serves four seriously hungry people. Serves six with a side dish*. Takes 1 hour. Pour a glass of cold, sauvignon blanc, something with bold citrus notes, anything New Zealand will do or Fetzer makes a nice organic one. Peel and cube potatoes and boil until soft. Drain and mash. Cut bacon strips into squares and sauté to medium (still a bit floppy), remove from pan and drain away fat. Sauté 1 piece whole and quaff it before Céline sees! Dice (not too fine) 1/3 of the onion and sauté until golden and translucent. Hint: throw it in the pan and wait – stop shaking it! Grate cheese and add to potatoes along with bacon and onion. Add ¼ cup of cider vinegar and a ½ tsp of salt. Pour sour cream into a large mixing bowl and knead in flour until the dough is no longer sticky, even a bit stiff. Dust your countertop with flour and roll the lot out to about 1/8 inch thickness. Use the sour cream container like a cookie cutter and cut out as many rounds as you can. You should get 24. Line the circles up and get ready to stuff. At this point you should have a small finger bowl of water handy. Because the dough is a bit elastic you will want to squish each down with you palm as you go. Add filling, about a golf ball sized dollop, wet the edges with your finger (hence the bowl of water) stretch the dough over the filling and press seams together. You may want to fold the seam over like a hem to make sure it stays together. Alternatively you can use egg white instead of water but I find it’s not necessary. Now you should have something that looks like a mini calzone. Bring a pot of water to a boil. 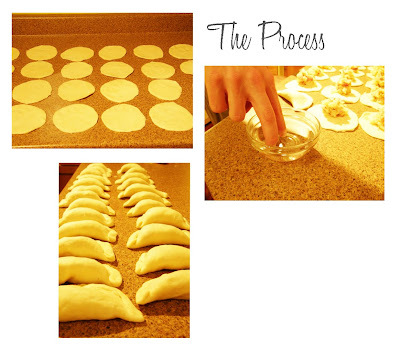 Slip the pierogies in one at a time. Make sure they do not stick to the bottom. As they star to float lift them out with a small strainer or slotted spoon and put on a rack to drip dry. They should be firm when they are done. In a large cast iron skillet heat up grapeseed oil or high quality organic canola oil on medium high heat. Once hot add a tbsp of butter (*hint: the oil stops the butter from burning, the butter adds the flavour). Fry your pierogies until brown and crispy (make sure they are dry or they will spit hot oil at you). While frying sprinkle generously with rosemary and some seasoning salt. If you want you can use course mineral finishing salt instead – but we like the seasoning salt. Serve on plates and drizzle liberally with pure Canadian maple syrup. The salt, rosemary and syrup are nothing short of genius together. Accompany with another glass of that sauvignon blanc. Bon appétit! *For the Carnivore: some good quality locally produced grilled pork sausage is good with this. *For the veggie lovers: Coleslaw!!!!! Cheat and buy some broccoli slaw which has red cabbage, shredded carrots and shredded broccoli stems or use green cabbage, carrots, red cabbage for your base. Add paper-thin slices of onion, slices of tart apple, raisins and sunflower seeds. Add a pile of fresh or dried dill, and mustard seeds or grated ginger for the spice lovers. Mix up a dressing with one part olive oil, one part maple syrup and 1.5 parts organic cider vinegar. You can stretch it by adding some apple cider or juice. I recommend using Herbamare or Spike to season the dressing to taste, but your favorite salt will do. Mix it all up in a bowl and let sit for a couple hours in the fridge for best results, but it can be eaten right away. Make lots ‘cuz this salad lasts a week! Alternatives: Desert. Try this recipe with marscapone cheese, figs and vanilla for a wonderful desert. Leftovers: Freeze ‘em and reheat in the oven. If you know you won’t eat them all freeze them before they are cooked (make sure you separate them so they don’t stick) and boil them from frozen. If you have leftover filling, in the morning grease a cast iron pan with butter, smush the filling out into a big patty and pop in the oven at 400 until brown. Serve with your favorite style of eggs, your favorite condiment (PC steak sauce or Ketchup) and a fresh sliced tomato with a little finishing salt. Health Tip: Organic Cider Vinegar cleanses the liver, alkalizes your system and is an all-around awesome health tonic! Cooking in cast iron gives you your daily iron – no joke.